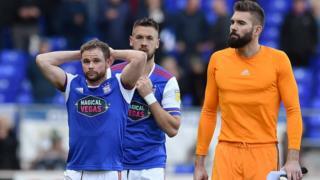 Ipswich Town have dropped their season ticket prices as they prepare for life in the third tier of English football for the first time in 62 years. The Tractor Boys, whose relegation to League One was confirmed on Saturday, have cut prices by between 12.5% and 15% for the 2019-20 season. An incentive will see prices drop further should at least 12,000 fans buy season tickets before 6 May. The club said it spoke to supporters before announcing the prices. General manager of football operations, Lee O'Neill, said: "We are expecting to lose close on £9m in revenue for next season so it's a balancing act between protecting season ticket revenue and getting the price as low as we can. "We hope supporters think we've got it about right." The club said supporters who purchased a season ticket before the first day of next season would have their ticket frozen at that price for the following campaign, if promotion to the Championship is won. Prices for renewing adult season ticket holders in the Sir Bobby Robson Stand start at £333, while early bird tickets begin at £352, compared to £381 last season. The most expensive adult early bird tickets in the East of England Co-Op Stand have dropped from £607 to £561, while under-12 season tickets in the family area cost between £38 and £43. The club said the price for seniors renewing starts at £10.22 per game, while for under 23s and under 19s it begins at £7.65 and £3.91 respectively. A "Town Targets" incentive has also been introduced, with prices falling depending on uptake. If 12,000 season tickets are sold before the early bird deadline of 6 May prices will drop by an additional 10%, increasing to 15% and 20% if 13,000 or 14,000 respectively are sold. Fan reaction on social media was generally positive, with one supporter saying "well done town, you got it correct" and another adding "now this is what I've been waiting for, here we go".